Bathroom designs come to life easily with Versital hand-made marble bathroom products. Versital manufactures true to life surfaces in a wide range of colours and finishes for ease of design on any project. Versital faux marble products are a fantastic alternative to real marble, being hard wearing, 100% waterproof and resistant to stains. Bathroom panels and vanity tops also offer the ease of cutting – no need for masonry equipment. 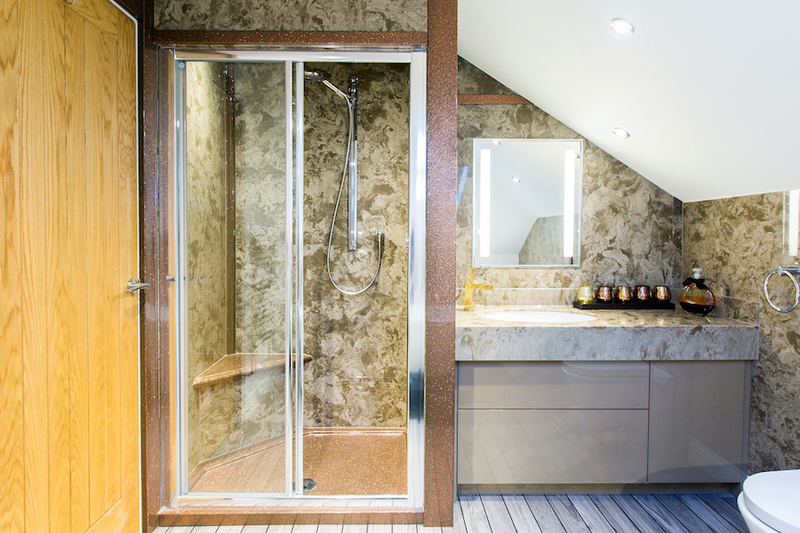 Versital is a proud manufacturer of bespoke shower trays to fit any situation. 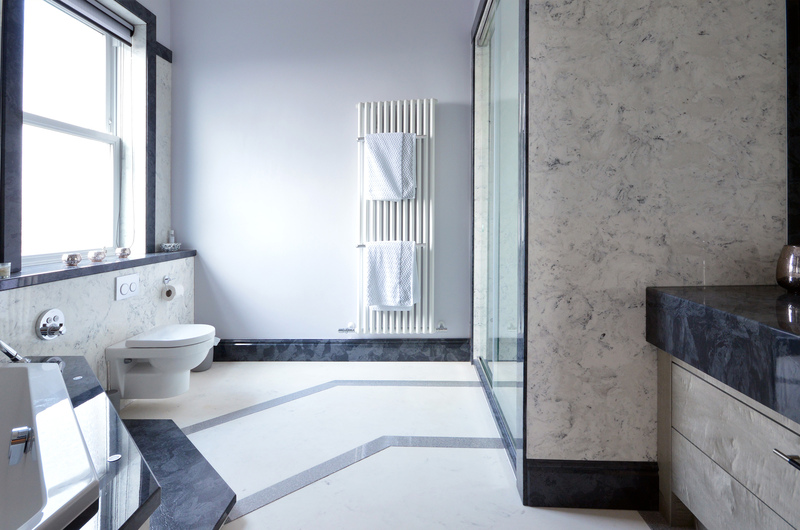 Using a bespoke tray gives you the freedom of creating a fully customised marble bathroom by fitting small and oddly shaped spaces. 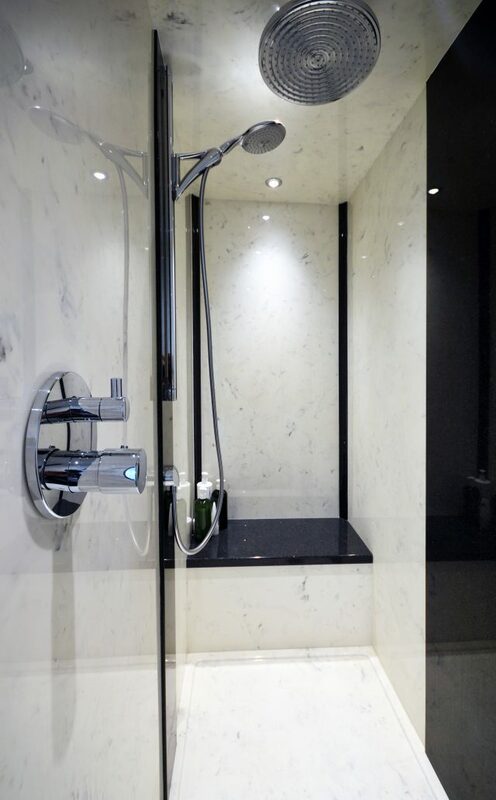 It also gives endless opportunities to create large wet room style shower areas in beautiful marble finishes, without all the difficulties that wet room floors can bring. 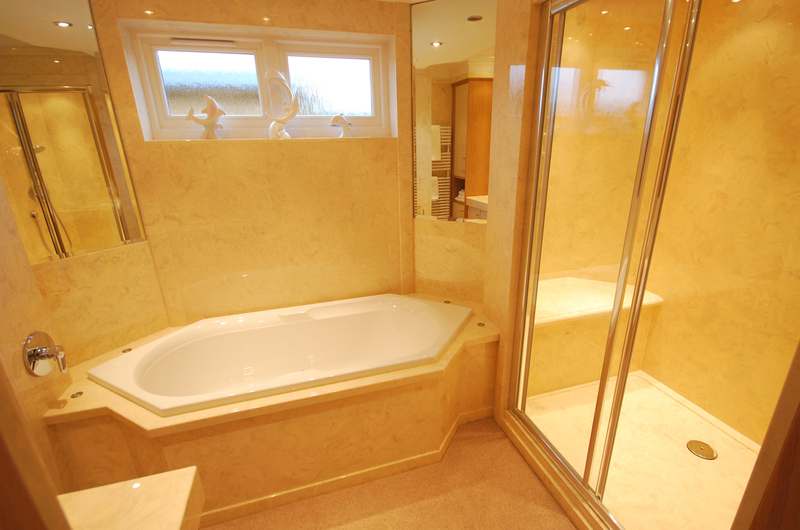 Custom trays can be used as a design feature to compliment the colours of the room, creating a luxury finished bathroom. Versital shower trays are all certified to anti-slip category 2 standard to ensure the perfect, safe showering experience. Unlike real marble, Versital trays offer all the beauty of a marble finish whilst also offering peace of mind with the cast anti slip finish built in. 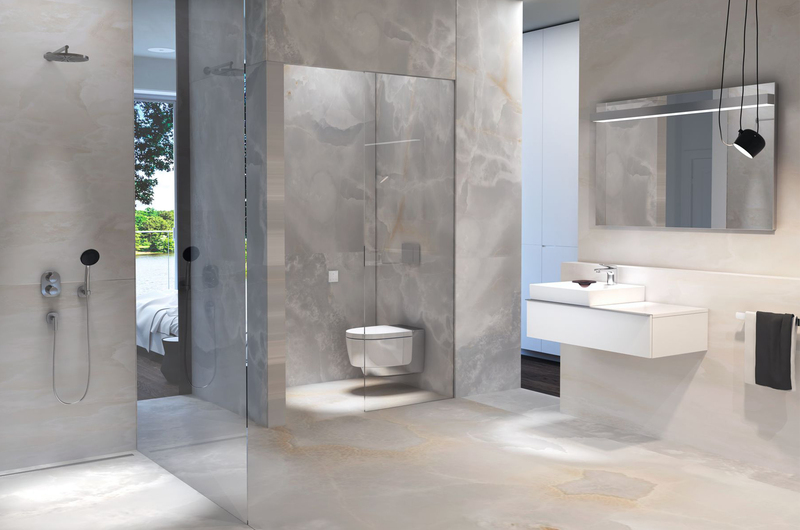 All trays are available in the full range of Versital colours and finishes, including over 40 different marble finishes to suit all bathroom tastes. 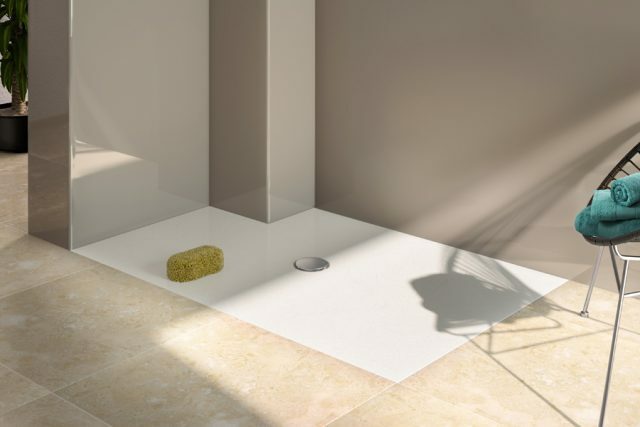 For customers looking for a seamless modern marble bathroom design, the Minima Bespoke Shower Floor offers a fully integrated rimless shower tray system. Minima can be fully integrated with the floor to create a beautiful unified finish. Furthermore, with the range of marble colours and finishes available Minima can be matched with any flooring to create a fully consistent bathroom design. The Minima bespoke shower tray can be made to exact personal specifications including the choice of the waste position and any cut-away or curved elements. That makes Minima a superior choice to complete any marble bathroom project. 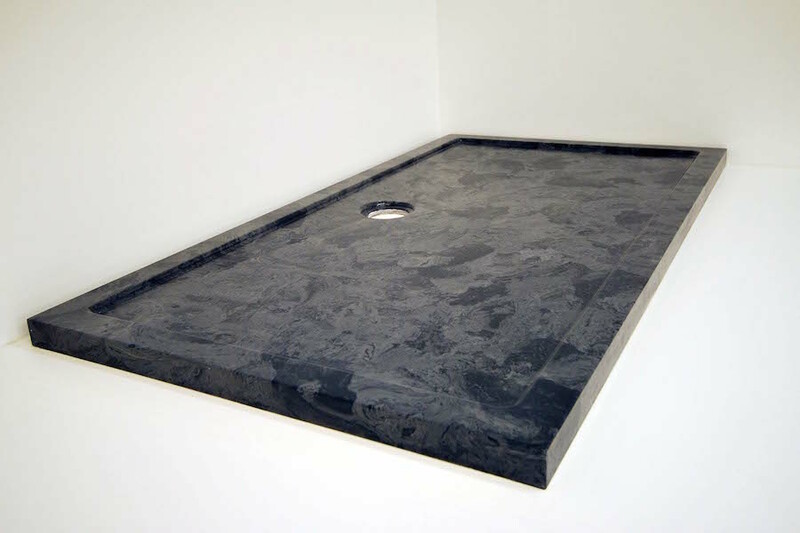 Versital creates a solid stone resin shower trays with a cast finish ensuring an anti-slip surface. In comparison to real marble our trays offer a superb value for money providing a fully stain and watermark resistance alongside over 40 marble style finishes all with an anti-slip cast in. Our innovative production method ensures fully unified design what in turn provides an array of opportunities for creating the ideal marble bathroom. All of the trays are made individually to each customer requirement, meaning that every need can be accounted for. 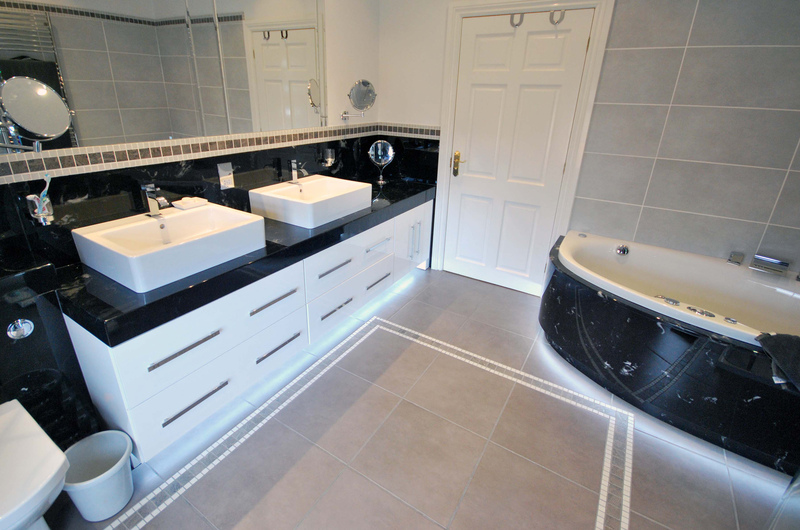 The largest available tray is up to 3m long and 2.6 m2, however contact us to discuss your requirements and we can work out the best solution for your bathroom. Wall panels produced by Versital make a fantastic alternative to tiles. 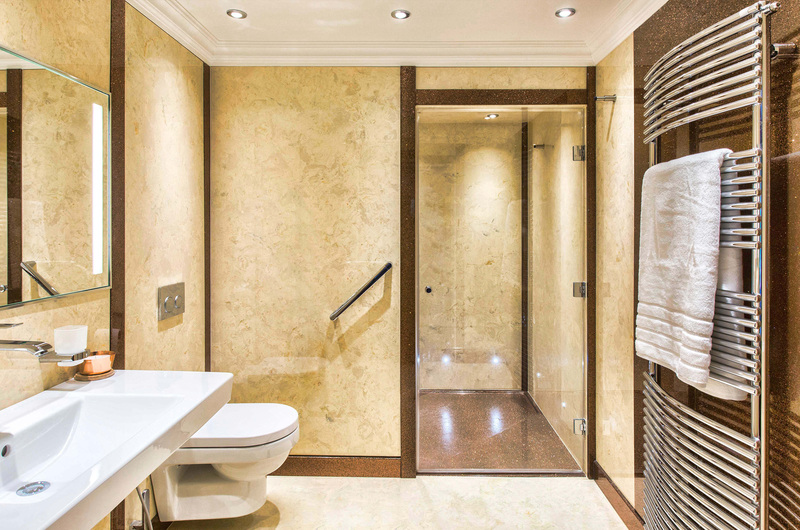 Our panels create a smooth, seamless and easy to clean surface that perfectly blends with luxurious marble bathroom. Cast from solid stone resin, the panels create a 100% non-porous exterior ensuring water proofing and a fully hygienic surface. They also do not require grouting and therefore are easy to install and provide lasting security from problems like lime scale and grout cracking. Versital panels are a perfect solution for steam and wet rooms. 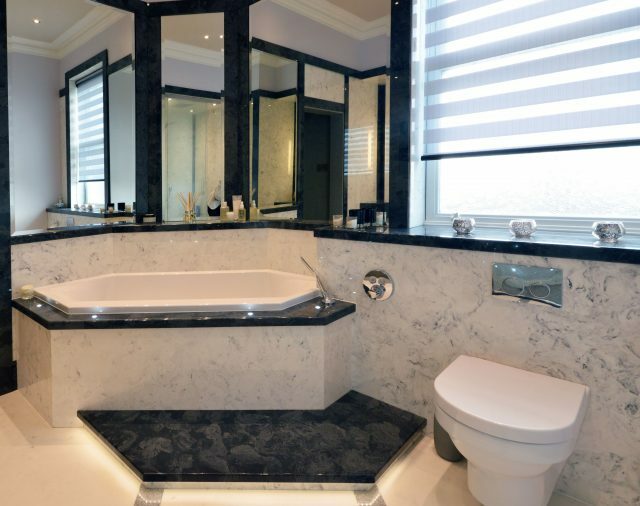 They not only provide a sleek uniform natural looking marble finish but they also ensure the room being fully waterproof diminishing the need for tanking. Furthermore, Versital panels ensure that the room stays waterproof and does not cause problems in the future. With the selection of over 40 marble and 50 other finishes the panels can compliment any marble bathroom. They work perfectly with our shower trays but can easily be used with other wall solutions. 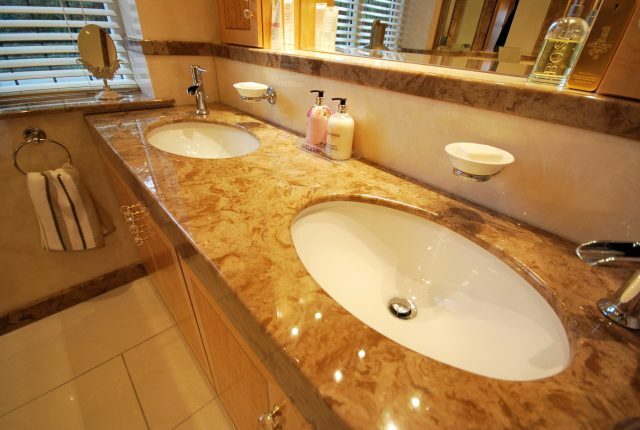 Versital manufactures bespoke vanity tops to suit all cabinetry. Similarly, to all of the above our vanity tops are fully waterproof, extremely stain resistant and easy to clean making them a great selection for the sink area where regular splashing occurs. Our customers can choose from a number of options including straight, shaped to template or complete with integral basins. The tops can also be prepared for any undermounted sink with rounded internal edges. As well as the shape customers can also chose from our full range of colours for the ease of design. Bath decks offer a beautiful finishing touch to the bathroom and create a truly seamless bathroom experience. Versital manufactures single-piece bath decks in a range of colours that can compliment any bathroom. Over 40 different marble finishes and over 50 other colours provide our customers with a broad selection to suit any needs and requirements. Each bath deck can be manufactured to have lights or any design feature incorporated. Our floor slabs offer an ideal alternative to tiling. With the selection of over 90 available colours including over 40 different marbles they can match any marble bathroom requirements. The floor slabs can be manufactured with a anti slip cast surface ensuring not only visual pleasure but also safety. Due to their stone resin structure they are fully water and stain proof making them an easy to clean solution for any bathroom. 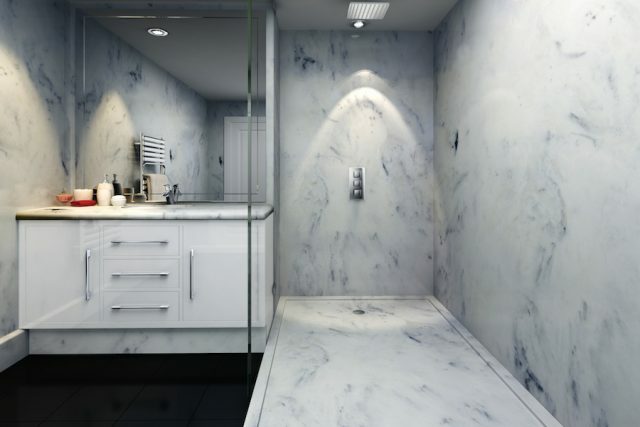 Creating a luxury finish in your marble bathroom has never been easier. Versital offers skirting and architrave in the full selection of colours to compliment any bathroom design. Use it around mirrors, to make stunning corners or to bring out the shower and create a real prestige feel. Each piece of dado is 300 cm long with the ease of cutting it can be made to fit any space. Versital skirting resists scuff marks from shoes and is fully water resistant making it the ideal product for any bathroom. You can also choose to use our plinth for finishing off cabinets or anywhere it might be required. Versital also offers soap and toiletry holders for shower corners and wall insets. 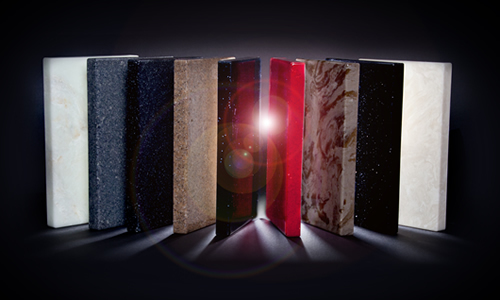 Available in the full Versital colour range including over 40 different marble finishes. 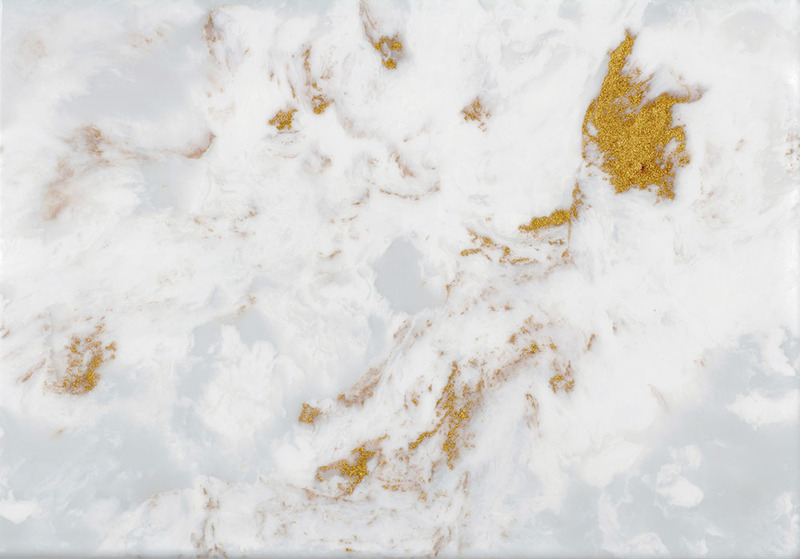 Versital has recently released a collection of brand new metallic marbles. They are a fabulous choice for anyone looking to add a little bit of sparkle to their bathroom. To discover the new selection just order your free samples and investigate them for yourself. Over 90 unique finishes. Versital gives the option of true to life marble and granite look shower trays, vanity tops, wall panels bath decks and finishing, whilst remaining completely non-porous and stain resistant unlike the natural material. Design and install the look you want, without the problems. Very cost effective compared with real marble. Like for like we are confident Versital will be better value for money than real marble. Moulded downstands and features built in – no seems or joints for a beautiful finish that won’t catch dirt. Matching tables, washrooms vanities and panels available. Each Versital product is hand made to order with realistic natural veining created by hand. Versital is a realistic looking alternative to natural marble with lots of benefits over the natural product. The protective gel coat also makes Versital exceptionally easy to clean, only requiring a gentle cleaner. The gel coat also has built in anti-bacterial properties to deal with everything a tough bathroom environment can throw at it.